Home > Skin Supplements > How Can Evening Primrose Oil Benefit Skin? In recent years, taking evening primrose oil as a health supplement was mainly done by women hoping to cope better with their menstrual cycles. Few people realise, however, that this oil is equally, if not more, beneficial as a skin care aid, making the skin softer and smoother and even helping to soothe eczema and treat acne-related conditions. The evening primrose plant, or Oenothora biennis, contains the essential fatty acid gamma-linolenic acid, which has many reported uses. Famous for its contribution to skin care in particular, it is reputed to strengthen skin cells and help raise their moisture content, helping to keep skin soft and supple. Extracted from the seeds of the evening primrose plant, which blooms a beautiful yellow, evening primrose oil is then mixed with a chemical called hexane. It is taken as a health supplement in capsule or other liquid form, although it is sometimes mixed in cosmetic products to be used topically. Since the 1930s, evening primrose oil has been used to treat eczema. An itchy skin condition, eczema is common in both children and adults causing the skin to become red, scaly and inflamed. Many things can irritate the skin and result in eczema, such as allergies to plants, animals and dust; pollution, chemical irritants etc. Studies have shown that a diet that is missing essential fatty acids can worsen eczema symptoms in some people, and has been shown to cause dry skin and flakiness in older people who do not have eczema. More recently, evening primrose oil has been used to treat a variety of other conditions. Women have found it particularly helpful when it comes to their menstrual cycles, as the oil is believed to help relieve breast pain associated with this, as well as PMT (pre-menstrual tension). 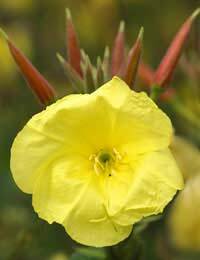 Evening primrose oil has also been shown to have possible effects in treating arthritis, cancer and even diabetes. It has even shown to have effect in treating bronchitis, when combined with the herb thyme. Interestingly it does not seem to work well in helping bronchitis on its own! Adults who take evening primrose oil as a health supplement should consult their doctor first, but the usual dosage to treat eczema is four to six grams taken per day, divided into several smaller doses taken orally throughout the day. Women who take it for menstruation-related breast pain usually take a dosage of three grams, divided into smaller doses throughout the day. Children under age 18 usually take three grams per day. Evening primrose oil can cause mild side effects, such as tummy upset and headache. Even if you tolerate health supplements well, tell your doctor if you wish to take evening primrose oil orally as it can interfere with other supplements as well as with prescribed medication, especially blood-thinners. People who take certain medications to control schizophrenia should avoid using evening primrose oil as it can increase the risk of seizures, and it is also not recommended for use during pregnancy. I have used Evening primrose oil capsules 1000mg three times a day. It help me alot with my Hair and Nail problems . I have been using it up to8 weeks and it's gave me positive results.